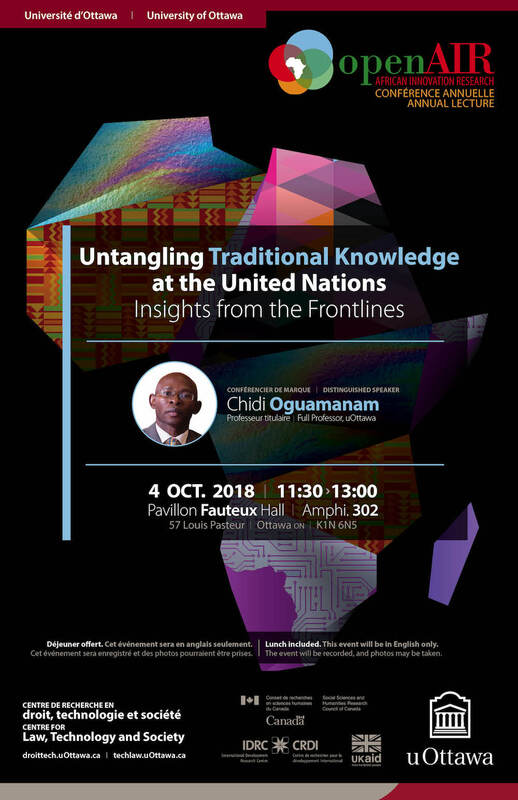 Chidi Oguamanam is a Full Professor in the Common Law Section at the University of Ottawa, a co-Leader of the OpenAir Network and a CLTS Faculty member. In 2000, the General Assembly of the World Intellectual Property Organization (WIPO), a specialized agency of the United Nations, established the Intergovernmental Committee on Intellectual Property and Genetic Resources, Traditional Knowledge and Folklore (IGC). The IGC's mandate was to undertake text-based negotiations for the effective protection of these subject matters. It was a response to the outrage by developing countries and Indigenous peoples over the failure of the global intellectual property system symbolized by the WTO-TRIPS Agreement to recognize the fused relationship of traditional knowledge (TK), genetic resources (GRs) and folklore (also known as traditional cultural expressions (TCEs)) as sites of innovation and creativity. That omission was an affront on the ability of people on the margins to participate and benefit equitably in the new global knowledge economy. Despite progress regarding TK in kindred regimes, such as the Convention on Biological Diversity, why has the IGC yet to deliver on its mandate for nearly two decades? What are the underlying dynamics, sticking points and the tensions that continue to stall and shape deliberations at the expert body? Were expectations from the IGC realistic or misplaced? Were all parties committed to the same outcome from the outset? What are the possible ways forward for the IGC and its mandate? This talk provides personal insights based on the speaker's experience as a participant in the IGC negotiations. Lunch included. Open to everyone! This is a free event. No registration is required. However, attendees can donate online to the Centre whatever they think is fair. The event will be recorded, and photos may be taken.